DESCRIPTION -- From the Canadian Pacific Line this is an original as used on board dining plate. Produced in the original design it is 8Â¼" (21cm) wide, bottom marked and in an excellent condition dating from the 1960â€™s (click on the picture to see a view of the underside of the plate). HISTORY -- The Canadian Pacific Line was a company under the Canadian Pacific Railway (CPR). The Canadian Pacific Railway Company was formed in 1881, and the company soon entered into ship-owning. In the beginning limited to transportation along Lake Superior and the Great Lakes. The transatlantic passenger service however, was not started before in 1903, when CPR took over the ships and service of the Beaver Line. The division was managed as the "Canadian Pacific Ocean Services" (C.P.O.S.). DESCRIPTION -- From the Harrison Line shipping company this is a cup & saucer showing the company houseflag and name on front, is in an excellent condition and dates from the 1960â€™s. HISTORY -- Harrison Line, officially T&J Harrison, was a shipping line founded by the brothers Thomas and James Harrisonin Liverpool, England in 1853. It ran both cargo and passenger services, starting with the import of French brandy from Charente. ... It became the Charente Steamship Company in 1871. DESCRIPTION -- Teapot as used in service from the British & Commonwealth Line shipping company, which is in an excellent condition and is bottom marked. It stands 4"(10cm) high and dates from the 1960's (click on the picture to see the markings on the base). HISTORY -- The Company was originally established in 1955 when Clan Line Steamers was merged with Union Castle to form The British & Commonwealth Shipping Company, a shipping business. DESCRIPTION -- From the 1930's this is a fantastic bird of paradise design teapot from the Canadian Pacific Line which is an as used in board item and the size is 6" (15cm) high. It is in an excellent condition and original from the shipping line. DESCRIPTION -- From the Palm Line this item is a kidney shaped oval china dish, 2 boxes of unused matches and two unused bar coasters. 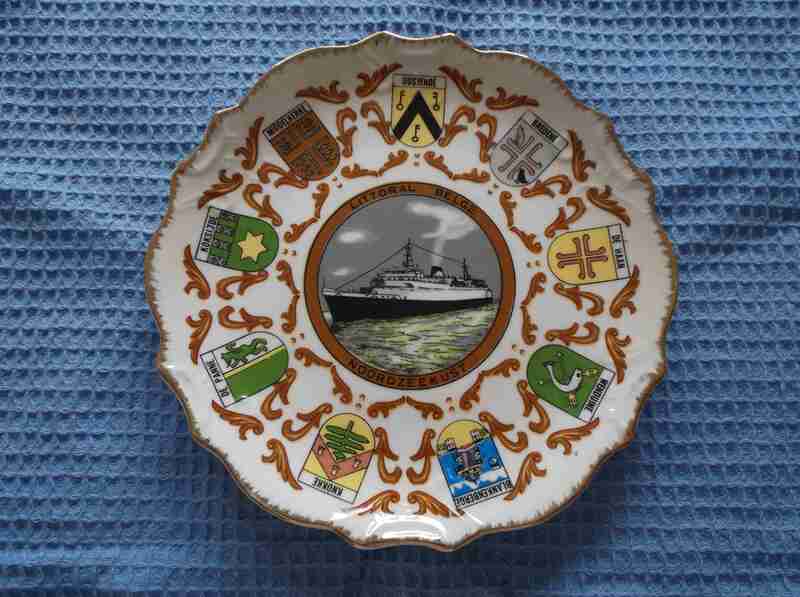 All items are in an unused or otherwise excellent condition and the the items date from the 1960's with the size of the dish being 8" (20cm) x 5" (13cm) and were the type of item used on board ship. HISTORY -- The Palm Line was a UK-owned shipping line that was engaged in the West African trade from 1949, primarily servicing the ports along 5,000 miles of coastline from Morocco in the north to Angola in the far south. It ceased trading in 1986. Palm Line was a member of both UK/West Africa Lines Joint Service (UKWAL) and Continent/West Africa Conference (COWAC) together with Elder Dempster, Black Star Line, Nigerian National Shipping Line, Guinea Gulf Line and Norwegian Hoegh Line. 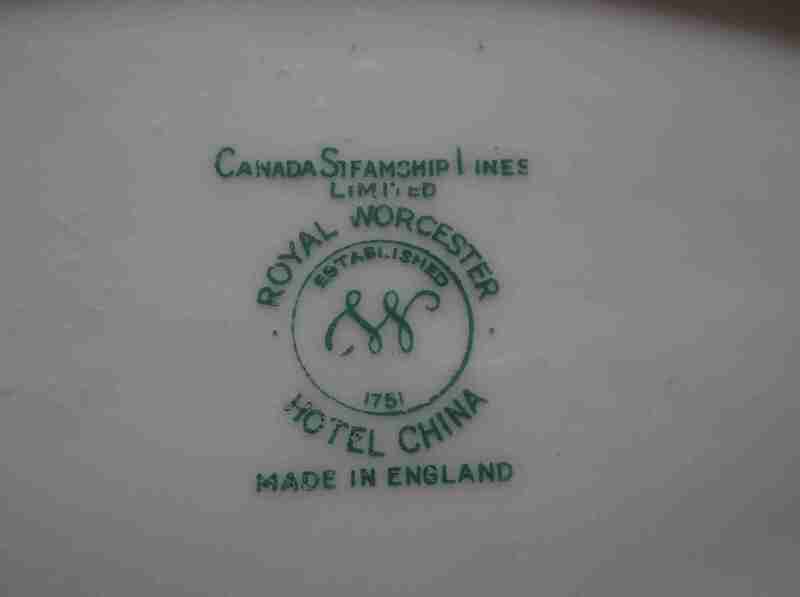 DESCRIPTION -- This item is the first one we have seen of its type and is an oval china dish from the Canada Steamship Company. 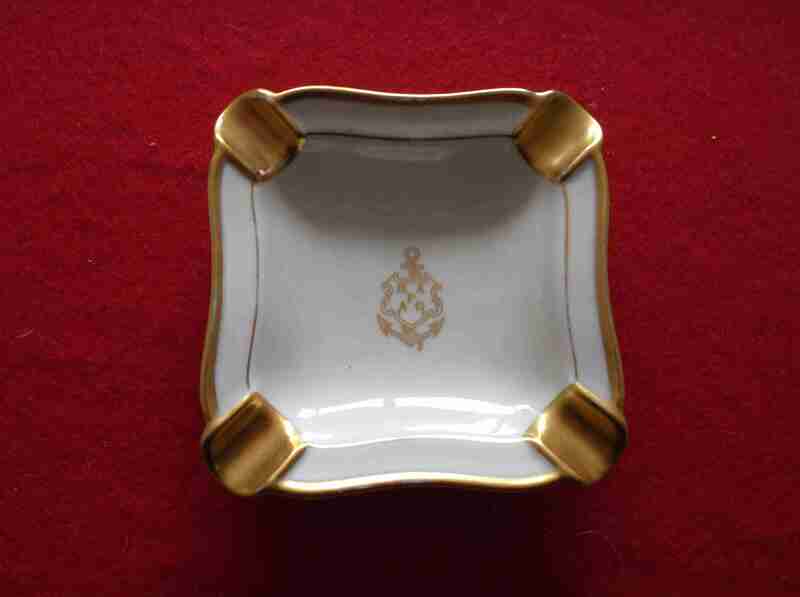 It is a Royal Worcester piece and is in a fantastic condition with the size being 8" (20cm) x 5Ãƒâ€šÃ‚Â½" (14cm) and would have been used on board ship (click on picture to see markings on base of item). HISTORY -- Canada Steamship Lines, a division of The CSL Group, is based in Montreal, Quebec with affiliate offices in Halifax, Nova Scotia, Hamilton, Ontario and Winnipeg, Manitoba. Our vessels operate under the Canadian flag and are fully crewed by Canadians. Our highly competent team - both shipboard and ashore - provides shipping solutions to customers every day. DESCRIPTION -- Souvenir wall hanging china plate from the Noordzeekust Line shipping company from Belgium and the size of the plate is 8" (20cm) wide and is in an as new condition. DESCRIPTION -- Superb item from the Hamburg America Line and is an original cabin ashtray (as seen from many adverts and pictures of the time). The size is 4" (10cm) square and is in a very good condition and an early item and a very rare find. HISTORY -- The Hamburg-Amerikanische Packetfahrt-Actien-Gesellschaft (HAPAG for short, often referred to in English as Hamburg America Line (sometimes also Hamburg-American Line, Hamburg-Amerika Linie or Hamburg Line) was a transatlantic shipping enterprise established in Hamburg, Germany, in 1847. 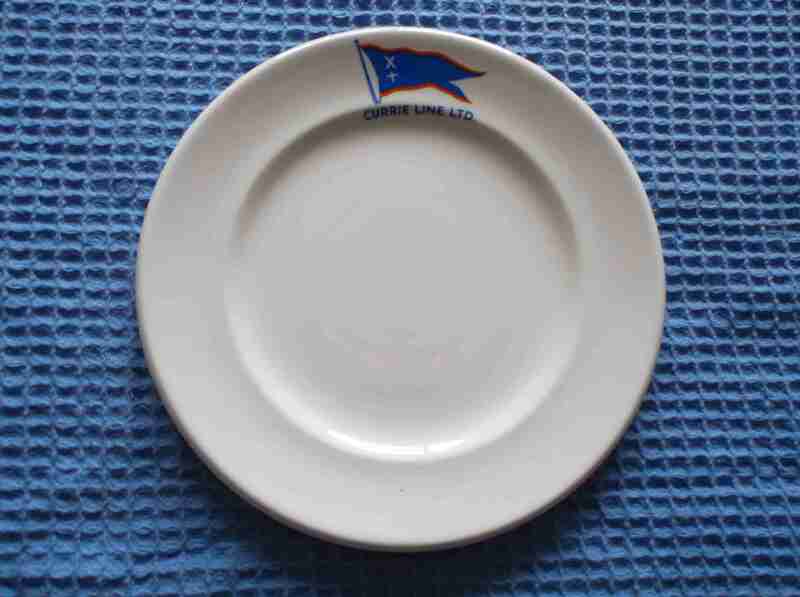 DESCRIPTION -- Dining side plate as originally used on board vessel for the Currie Line shipping company and the size is 7" (18cm) wide and it dates from the 1960's. HISTORY -- Currie Line was Founded 1913 by the merger of three Liverpool companies and there is little information available about this company on the Internet. It was a subsidiary of the Royal Mail Steam Packet Group from 1917 to 1930 but became independent again in 1930 when the Royal Mail group broke up. It purchased stock in Belfast Steamship Co. Ltd., Burns & Laird, British & Irish before going into a decline. British & Irish was purchased by the Irish Government in 1965 and the remainder by P&O. The main part of Currie Line was purchased by the Anchor Line in 1969. DESCRIPTION -- This item dates circa 1960's and is an ashtray of type as used in the ships saloon bars of the Chandris line shipping company. It shows the company houseflag in centre and the name on the front and is 4" (11cm) wide (click on the picture for another view of the item). 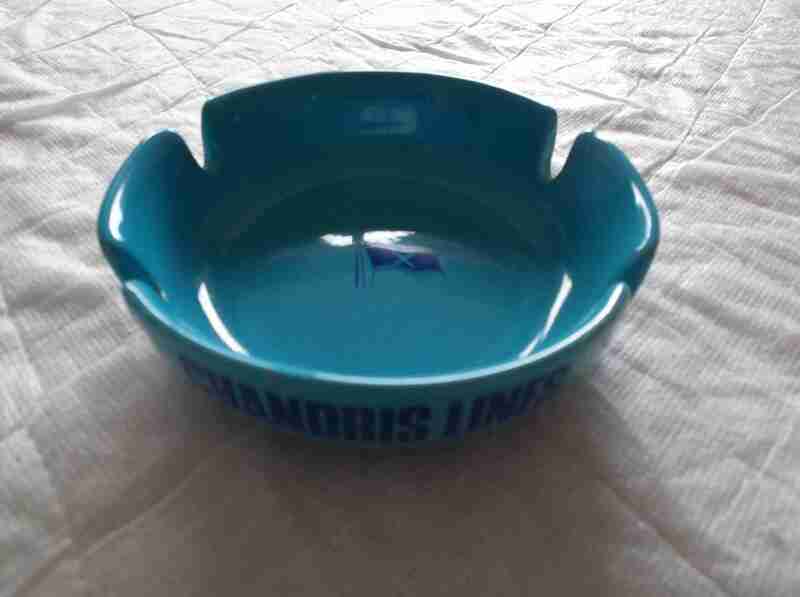 HISTORY -- Chandris Line was a Greece-based shipping company founded in 1960 by Antony Chandris to operate ocean liners between Greece and Australia. Initially the company also traded under the names Greek Australian Line, National Greek Australian Line and Europe-Australia Line. Following a period of expansion, in 1974 Chandris Line merged with Chandris Cruises, a separate company founded in 1960 by Anthony Chandris' brother Dimitri Chandris to operate cruises in the Mediterranean, to form Chandris Line Chandris Cruises.